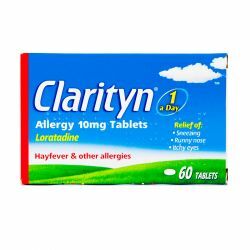 Clarityn Allergy 10mg is a white tablet which contains the active ingredient Loratadine. Loratadine is an antihistamine which helps to reduce allergic symptoms by preventing the effects of a substance called histamine, which is produced in the body. 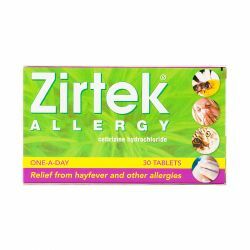 It helps relieve the symptoms associated with allergic rhinitis, for example hayfever, such as sneezing, runny or itchy nose and burning or itchy eyes. It can also be used to treat skin allergies including hives. Clarityn Allergy is available in packs of 7, 14, 30 or 60 tablets. Clarityn Allergy should be kept out of sight and reach of children and should not be stored above 30 degrees celcius. Clarityn Allergy is for oral use only and should be taken with water. The recommended dose for adults and children over 12 years is to take one tablet daily. Children under 12 years but over 2 years of age should take one tablet daily as long as they weigh more than 30kg or 4st 7lb. Children who are under 2 years of age or weigh less than 30kg should not take these tablets. The tablets should not be chewed. If you take too many tablets you should contact your doctor. If you forget a dose, take the next dose when needed provided you only take a maximum of one tablet in a 24 hour period. Do not double dose. The active ingredient in Clarityn Allergy is Loratadine. Other ingredients include lactose monohydrate, maize starch and magnesium stearate. Clarityn Allergy should not be taken if you are allergic to any of the ingredients in the medicine. You should not take the tablets if you have had an allergic reaction to any other antihistamines or if you are pregnant or breast-feeding. You should speak to your doctor before taking Clarityn if you have liver disease. 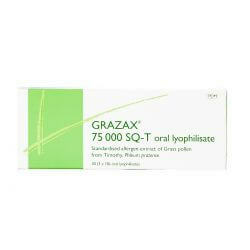 If you are scheduled to have any skin tests, you should not take these tablets for two days before. You should make sure to mention if you are taking any other medicines, including medicines obtained without a prescription. As with all medicines, Clarityn Allergy can cause side effects, although not everybody gets them. You should stop using Clarityn immediately if you notice any signs of an allergic reaction. Side effects which have been rarely reported are difficulty in breathing, swelling of the face, neck, tongue or throat. If any of these side effects occur, stop taking the tablets and contact your doctor. Side effects reported in children aged 2 through 12 years include headache, nervousness and tiredness. 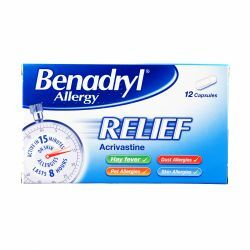 In adults the effects include drowsiness, headache, increased appetite and difficulty sleeping. Other side effects include dizziness, irregular or rapid heart beat, nausea, dry mouth, upset stomach, liver problems, hair loss, rash and tiredness.